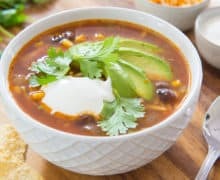 This Chicken Tortilla Soup has tons of flavor, with corn, black beans, green chiles, and plenty of spicy smoky broth. Finish with melted cheese and crunchy tortilla chips for a delicious meal! Might Chicken Tortilla Soup be the best soup of all? I’d certainly say it’s in the running. I happen to love soup as a general food group, but I understand why some people don’t love it. 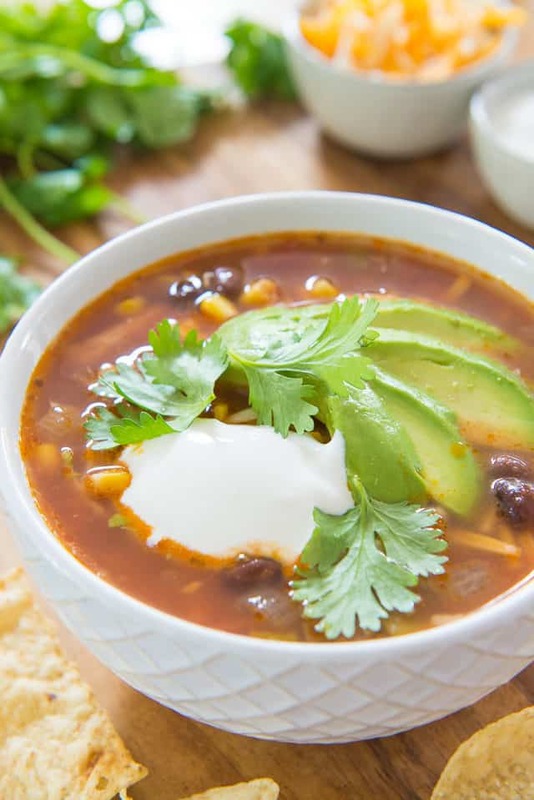 Sometimes soup can be a bit too watery and not hearty enough to be a main meal, but this is where Chicken Tortilla Soup is an exception to the rule. It can certainly be a meal in and of itself! The flavors are also wonderful, with a slightly spicy, smoky broth, and that general Tex-mex flavor theme. Add gooey cheese and crunchy chips to the mix, and it’s almost reminiscent of nachos, but in a little bit of a healthier form. Leftovers also keep beautifully, so sometimes I’ll make a double batch and freeze some of it. All you need to jazz it up before serving is a few toppings like sliced avocado or guacamole, sour cream, cheese, and chips, and it’s ready to go. 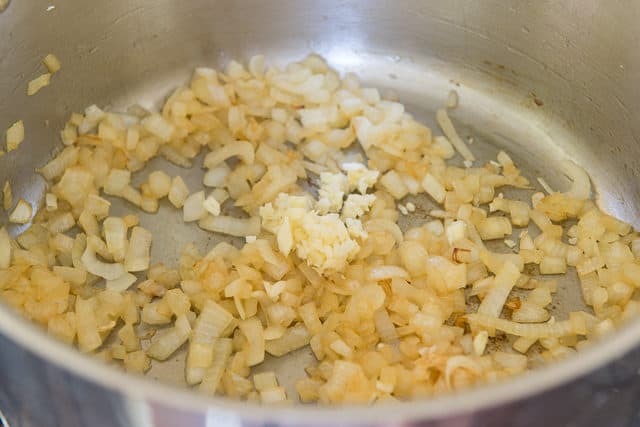 There should be lots of remaining brown bits on the bottom of the pan from the chicken, and we’ll incorporate those flavors into the onion! 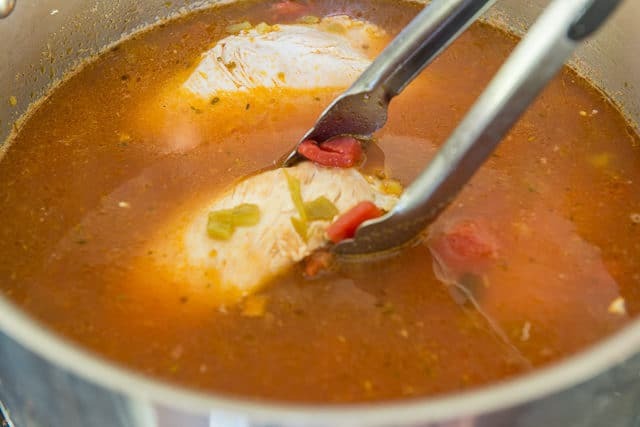 Simmer the soup gently for about 15 minutes, until the chicken is cooked through. If I’m feeling up to it, I’ll fry my own tortillas instead of using bagged chips, but it’s quite a bit more work. 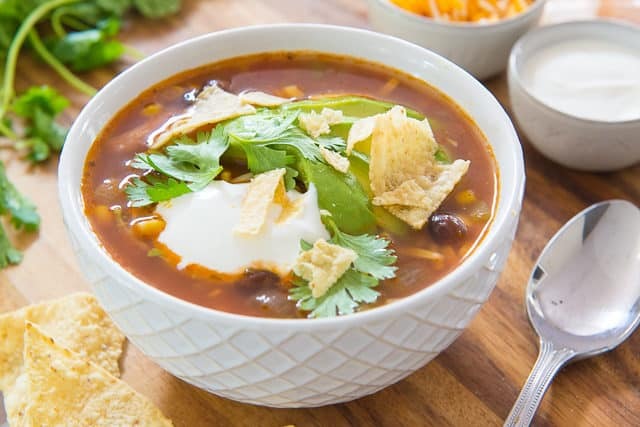 Hearty store-bought tortilla chips provide a great crunchy texture for the soup. Chicken Noodle Soup is another one of my quick favorites for comforting soup, as well as Sausage and Kale Soup, and Carrot Coconut Soup. Enjoy! Can Chicken Tortilla Soup be frozen? Yes, definitely! Cool it in the fridge first, then freeze for up to 2 months. 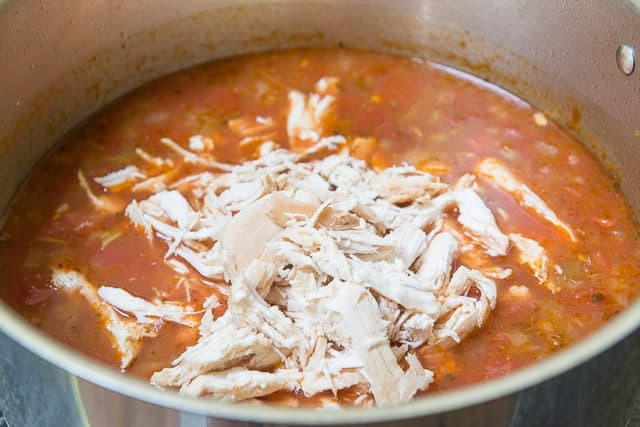 How to Make Chicken Tortilla Soup in Crockpot: You can adapt this by putting all the ingredients in a slow cooker, and cooking for 8 hours on low. The flavor is not as good as on the stove, but it’s still flavorful. 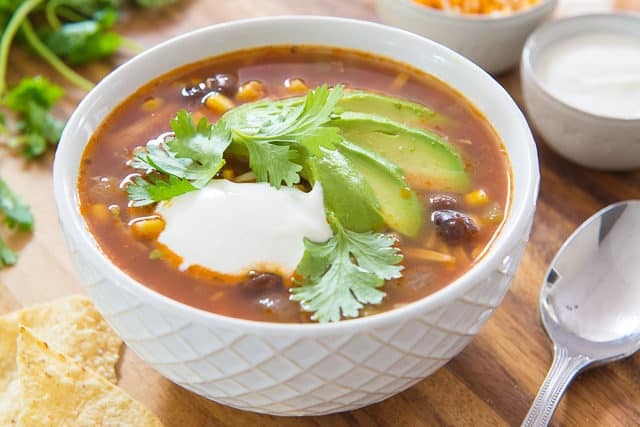 Is Chicken Tortilla Soup gluten-free? Yes, this one is. Heat 1 tablespoon of olive oil in a large soup pot set over medium high heat. Season the chicken breasts generously with salt and pepper, then sear in the pan for about 2-3 minutes on each side, until golden brown on both sides, but not cooked through. Remove the chicken to a plate, then add the chopped onion, 1/8 tsp salt, and the remaining tablespoon of olive oil. 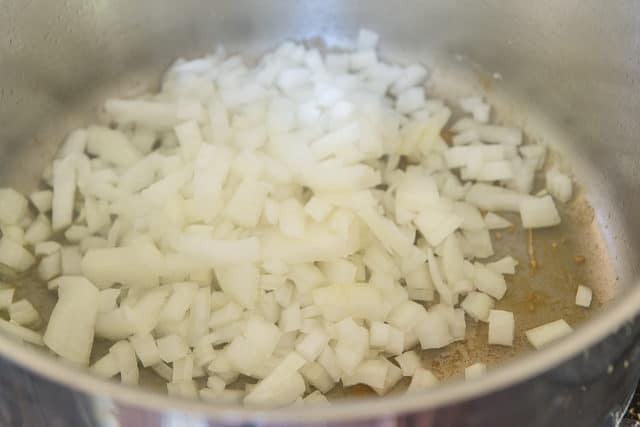 Turn the heat down to medium, and cook for about 5 minutes, until the onions have softened. Add the garlic, and cook for 1 minute, until fragrant. 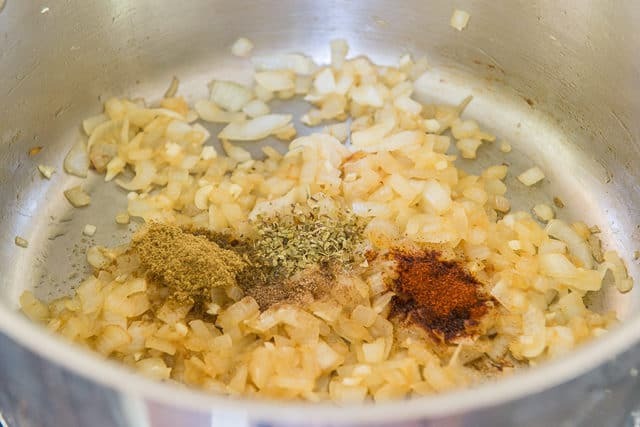 Add the cumin, chipotle, oregano, and coriander, and cook for another minute. 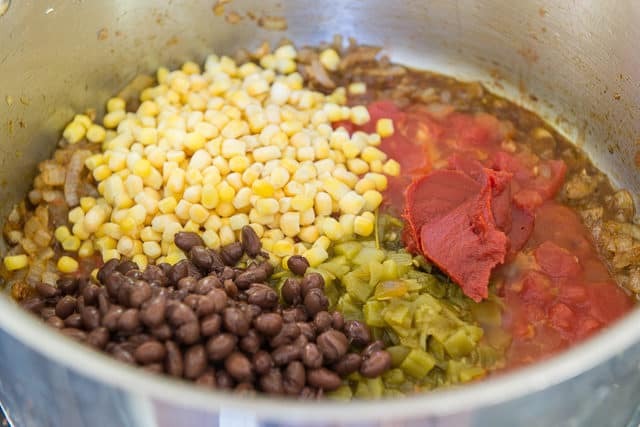 Add the corn, beans, tomato paste, diced tomatoes, diced green chiles, chicken broth, and reserved chicken breasts. Bring the soup up to a boil, then reduce to a simmer. 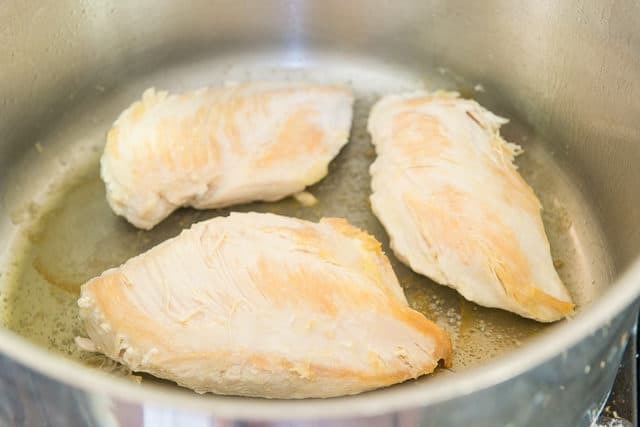 Cover the pot with a lid, turn the heat all the way down to low, and simmer gently for 15 minutes, until the chicken breast is cooked through to 165F. 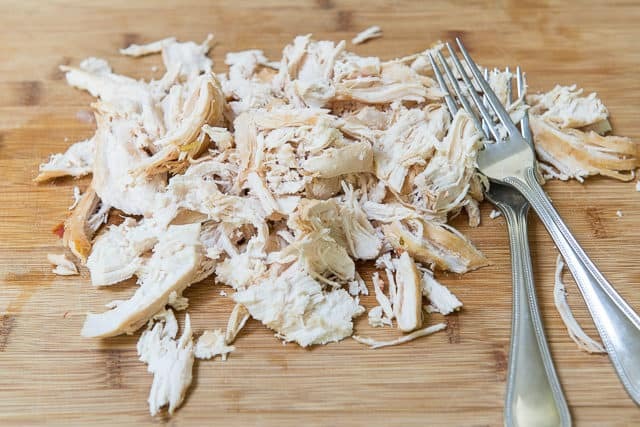 Remove the chicken breasts to a board, and shred with two forks. Return the shredded chicken to the soup. Taste the soup and make any necessary seasoning adjustments, then serve with desired toppings. Enjoy! Post updated with new photos, writing, and tips in September 2018. Originally published September 2011.